24×30″ Acrylic on Canvas– I hiked up San Ysidro Canyon last week to paint this prismatic pool. Yesterday in Cold Springs canyon my daughters found three California Newts in similar pools– so nice hiking up a canyon in the spring! 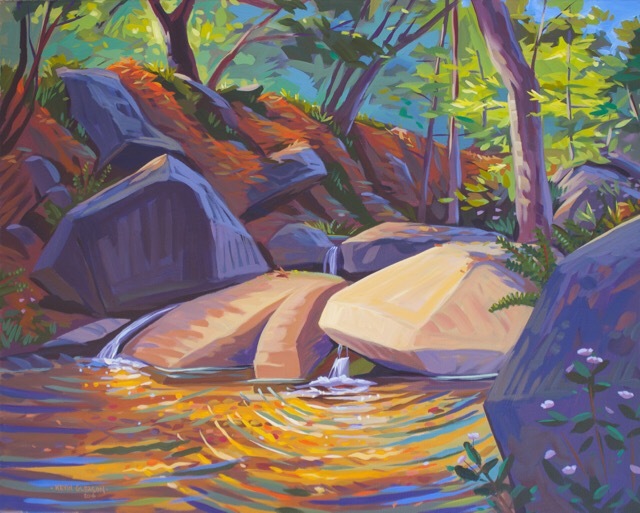 Tangerine Falls– Acrylic on Canvas 12×36″– I hiked up here twice this week… you need to go right after a storm for it to be flowing these days. Such an awesome spot. I think I’m going to need to add a bottle of calamine lotion to the price of this one for the poison oak on the way up. Acrylic on Canvas– 24×60″– This is the path on the west side of Devereux Slough with a peak of the ocean on the horizon to the right. The sun’s coming up nearly due east with the equinox near and as you walk down the path you get to pass through the stripes of warm golden sun and cool eucalyptus shadows. Acrylic on Canvas Board–12×24″ — This is the view from City Hall at the corner of De la Guerra and Anacapa as the sun is sinking to the west. I was amused by the way people were pressing the cross buttons on each corner and all seemed to be moving clockwise for some reason… maybe they arrived in counter clockwise directions at sunrise.